BITSAT 2016 Iteration II Results: The official website of BITS Pilani released the results for the BITSAT Iteration 2 exam. The Birla Institute of Technology & Science (BITS), Pilani conducted the admission exam for the first-degree engineering programmes. The result of this examination has declared by the officials. The candidates can now check their results from the link that we provided here below. Scroll down and get the Official website page directly from here. 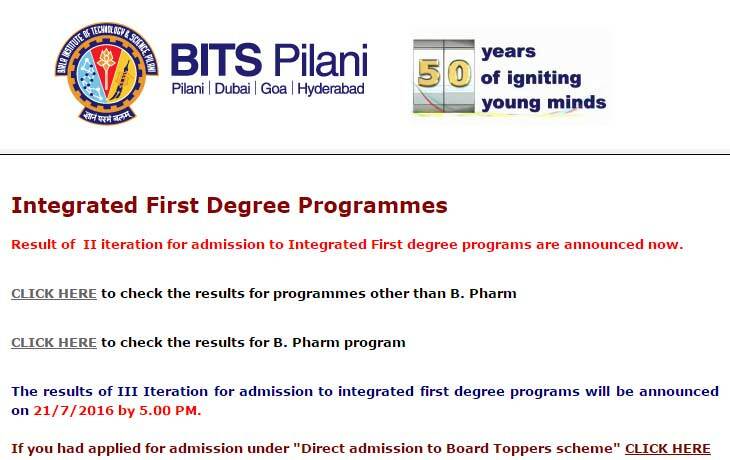 Result of II iteration for admission to Integrated First degree programs are announced now. Kindly visit the above direct link OR visit the official home page of BITS website. Fill the required details as correct. Now, the result will display on the screen. Check your result and print/save/download it for further use.